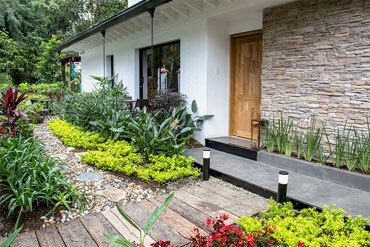 Patio Del Mundo is a charming villa in the heart of Medellin lovingly restored by a French family. With a lush tropical garden and an enchanting view, it offers a unique setting for you to enjoy your stay in "the city of the eternal spring". 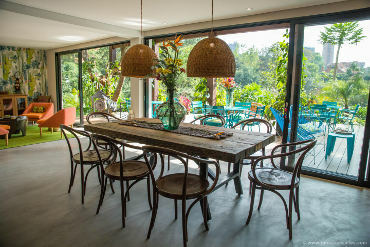 The villa is an oasis of serenity and well-being, perfectly nestled in the center of the El Poblado Provenza neighborhood close to bars, restaurants, boutiques, museums and parks. 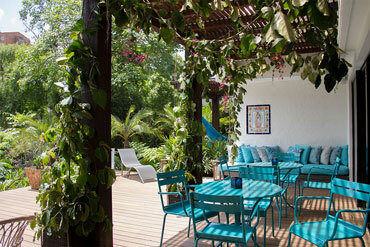 As a traditional renovated villa, Patio del Mundo is an invitation to travel. 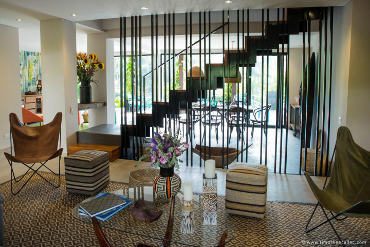 The architectural design of its common space celebrates Colombia’s unique arts and cultures, and each guest room has a character of its own evoking exceptional places from around the world. The villa’s garden is a tranquil getaway in the center of the city where you hear the murmur of a nearby river and the gentle chirping of the birds, and enjoy the grace of the wild orchids while sitting in the shade of the pergola and the sheltering Mango tree. A stroll along a path lined with avocado, banana and orange trees leads you to a deck where the Jacuzzi is located. 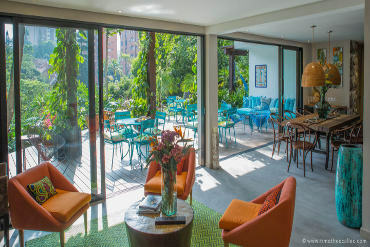 The terrace, nestled above the garden, welcomes you for breakfast in the morning or for a leisurely drink in the evening, where you can enjoy the colors of the sunset and kick off your night in Medellin style. Please do not hesitate to contact us for enquiries at Patio Del Mundo.